* Artificial lights – Any Vray light (Area, point, IES etc) used as fill light or to create any specific mood. I will be recreating this workflow concerned with HDRI and Directional light as SUN light for Interiors and Exteriors. It is imperative that we first know how to use HDRI correctly to simulate proper lighting with correct exposure. In above scenarios (Exterior and Interior) VrayPhysical Camera plays a vital role in simulating DSLR exposure with physically accurate lighting values (Real life light intensity values in Luminance or Radiance). It is important to know why we use Physical Camera features in any Rendering Engine. 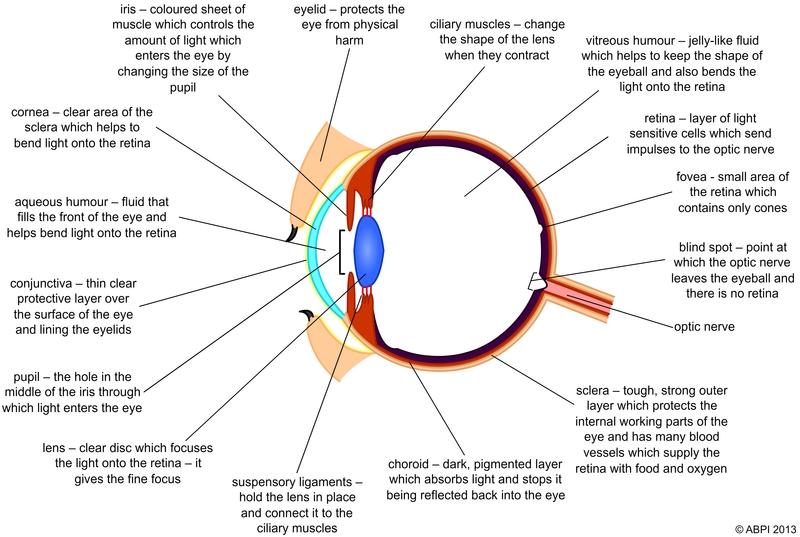 In real life, human eye plays a critical role in compensating for difference in light intensities we encounter on daily basis by controlling amount of light entering, through increasing or decreasing iris size. When it comes to simulating human eye behavior technically, DSLR Cameras come really close to do so with ample amount of control and as we are already using these cameras to take photographs of our surroundings, it is easy if we recreate those settings virtually in our rendering engines also. It’s a well-known fact that to render virtual images/environments, basic knowledge of photography and light behavior plays a critical role. Question – Why the hell I am reading about human eye and DSLR camera in a blog concerned with light setup in Unreal Engine? 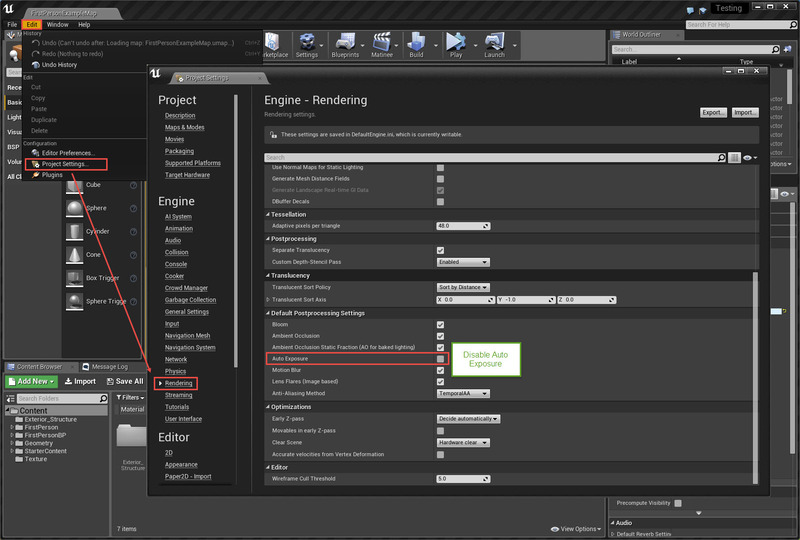 Answer – It’s always important to understand basics that are concerned with lighting workflow irrespective of application and also Unreal Engine got this awesome “Eye Adaptation” already incorporated in the form of “Auto Exposure”. But to understand that properly, it’s important to get some basic idea first. “Auto Exposure” settings are in the Post Process Volume. Now as we have some basic understating about the exposure settings in the Engine, we will proceed with creating a simple scene only lit by HDRI. 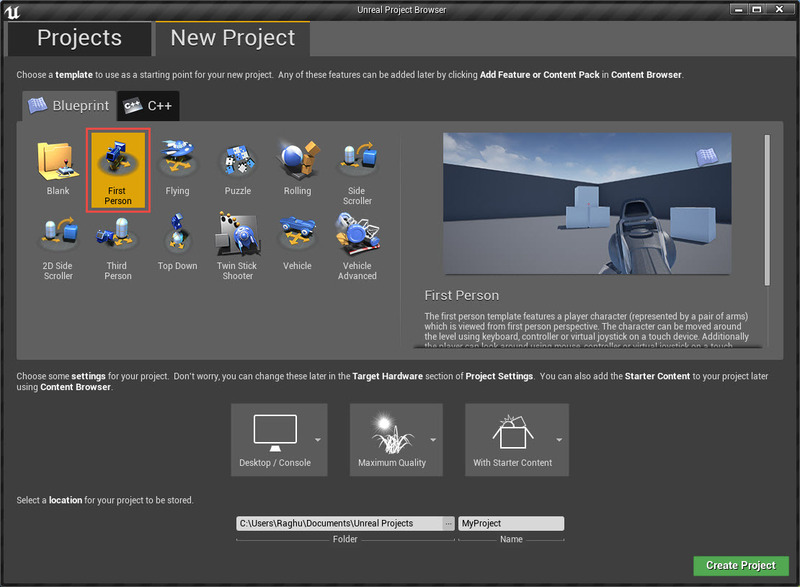 I am assuming that my readers have some basic knowledge of Unreal Engine, so will skip some fundamental steps. 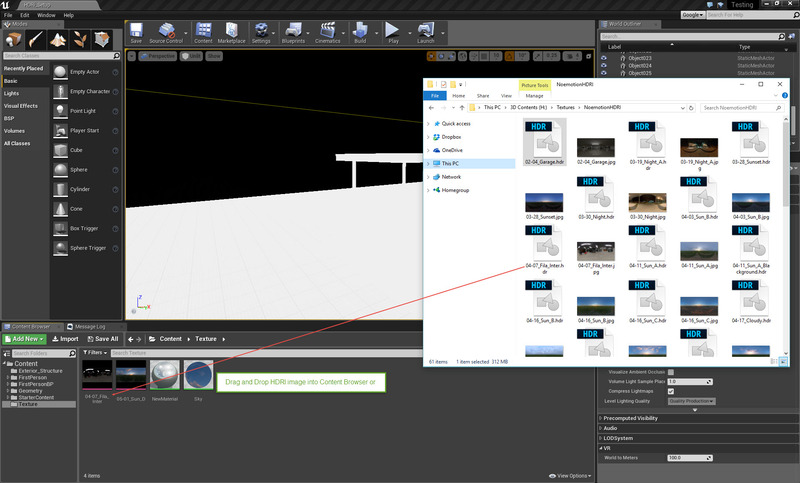 In this project we will create a new “empty level” for our HDRI workflow (save it before starting work). 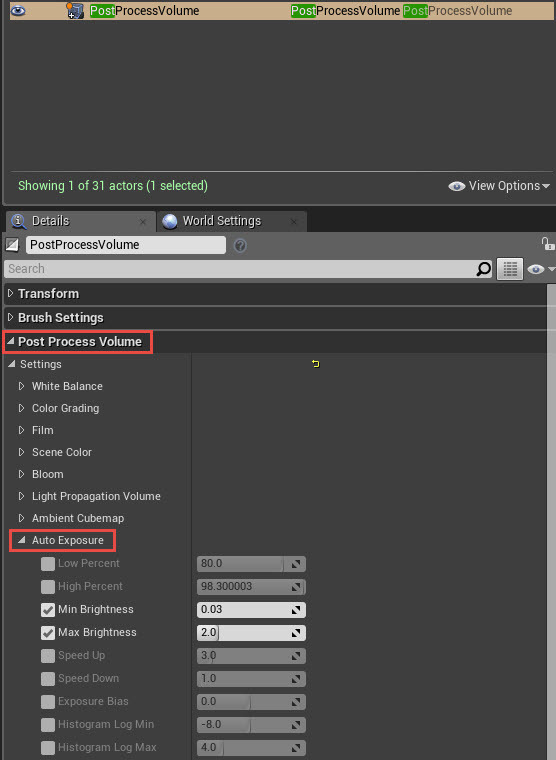 After that we will create “Lightmass Importance Volume” covering all of our meshes in the level which are going to render. 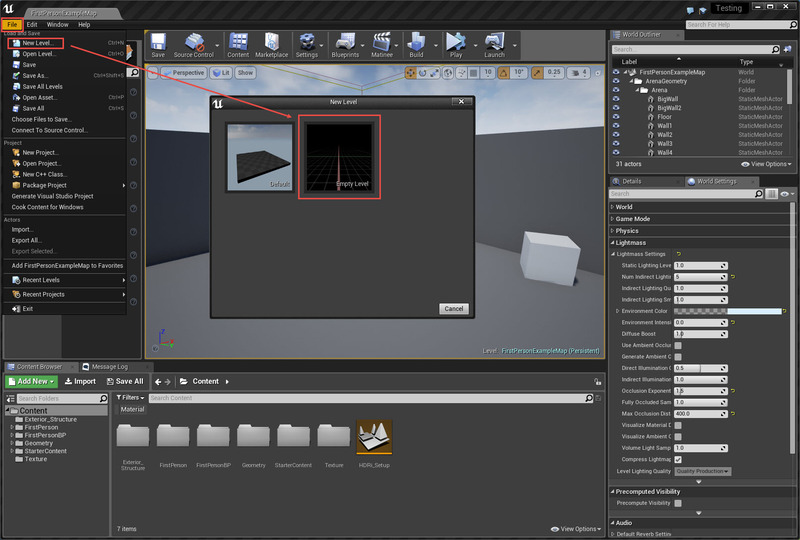 Next step will be of creating Box Reflection Capture wrapping entire meshes. This is very important for simulating correct reflections on objects inside and outside the building, you can also use large sphere reflection capture in exteriors (results want change that much). Now it’s time setup HDRI as our environment background and create “Skylight” that will use the same HDRI for lighting but before that we have to import our HDRI into Engine. There are several methods to do so but we will go for the easiest one i.e. Drag and Drop. I am using HDRI’s from – http://noemotionhdrs.net/ It’s one of the best free resource for HDRI.